Defeat the Spear of the Church to bring you one step from the end of Dark Souls 3: The Ringed City. This Dark Souls 3: The Ringed City walkthrough chapter kicks off after you’ve passed Darkeater Midir on the bridge for a second time, and unlocked the shortcut gate near the Shared Grave bonfire leading back to Ringed Inner City. We’re almost at the very end of the DLC now; all that stands between you and the very end are two bosses, a cutscene and an optional NPC fight. “All,” ha ha. Although you may have just as many questions as before, we’re about to learn some of the secrets of the Ringed City. Are you ready? Let’s do this. Take the lift from the Ringed Inner Wall bonfire and head out the door into the fresh air for a lovely view of the Ringed City now that the weather has improved a little. There’s a ringed knight ahead who’s a little more deadly than usual, so cheese to your heart’s content; the lift can be handy here. He drops the Ringed Knight Paired Greatwords, if you fancy such things. On the way to this fellow you can collect some budding green blossom. There’s an altar here for the new covenant, and behind it is a ritual spear fragment consumable. On a side path to the left of the church doors, you can drop down to grab some twinkling titanite, then drop down again to get back to the main path. Approach the church doors for a little dialogue. Open them and enter to encounter a boss fight fog door. This is a fight that’s something of a gamble. If you’re online, you’ll be facing off against another player from the new Spears of the Church covenant, with all the uncertainties that brings. If not, you’ll face an NPC called Halflight, Spear of the Church. When you enter the boss fog you’ll first see Adjudicator Jago, who is a grey giant. You can beat him up for a divine blessing, but he’ll despawn after a few moments anyway. You can get a divine blessing from it, though. The battle actually begins when Adjudicator Jago summons in a Painting Guardian – a type of NPC familiar to veteran Souls players, but much tougher than usual. “Make haste,” he says, and yeah, you want to – if you leave it too long, you’ll have to fight the Painting Guardian and the boss. Part way through the battle Jago will say “make haste” again, and that means the Painting Guardian is coming back for another go, so you’ll have to face two targets. The good news is that Unbreakable Patches is pretty good at keeping the Painting Guardian occupied once he has aggro’d onto it, so if you’re alone and not able to take it down quickly while under attack from the main boss, you can just lure them together. The Painting Guardian isn’t so tough. They have has very quick dagger attacks and can throw a church shiv, but they have pretty low defence and interrupt fairly easily, so you only need to dodge once and start wailing to quickly whittle it down. In the second phase, the Painting Guardian adds some new tricks. One is some sort of spell; it’ll kneel and a large circle appears around it. We never got close enough to find out what this does – maybe it’s a heal, or an AoE? – but it’s a great cue to sneak in a backstab. The other enemy is the real problem. Whether you end up fighting Halflight, Spear of the Church or another human player, they each come with a spell similar to Homing Soulmass and dole it out constantly, which means whenever that halo of lights is around them, if you get close they’ll dart at you. It’s easy to dodge if you go sideways as they fire, thankfully, but it can shut down an otherwise fine opening for a melee. We can’t give you advice on what else a human player may be packing, but Halflight has a spell that creates a long, persistent line of spears. She’ll glow white briefly before this happens, so immediately roll away. Weapon-wise, Halflight uses a one-handed sword and will sometimes fire dark energy from it in a beam directly ahead of her. Watch for the overhead vertical swipe that telegraphs this. She’ll also sometimes use Hold, so if you see her assume the stance keep your distance and maybe hit her with a spell or bow. Speaking of ranged attacks, Halflight will sometimes pull out a bow and start pinging away, or use the Lightning Arrow spell. She generally does this if you’re alone and have turned your attention to the Painting Guardian, so keep moving as you duel the second combatant. The final boss is really close now. 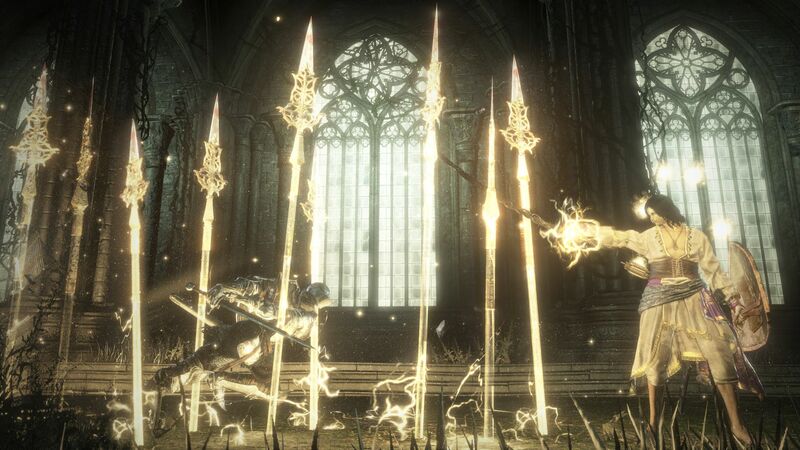 After defeating the Spear of the Church, head out ether of the doors at the back of the room and climb the short flight of stairs to activate the Church of Filianore bonfire. If you’re ready to proceed with the DLC (you might want to do the optional boss now, so you can summon Shira, but it will still be available later), take the lift and climb the stairs. Open the door, approach Filianore and touch the egg to trigger a cutscene. When the scene ends, activate the Filianore’s Rest bonfire and then explore the new area. Look at all that ash. The Ringed City no longer stands against the end of the age of fire. A hollow is dragging himself across the ash to one side of this area. He’s not hostile. Approach to trigger a bit of dialogue. The final boss arena is found by following the hollow’s drag trail towards and through the arch you can see ahead and left, but there are a couple of other things to do in this desolate landscape, believe it or not. If you like, hug the left wall and top the rise to find a ringed knight with paired greatswords. He’ll drop a titanite slab, but without Hidden Body this is a long slog cheese due to the distance you’ll have to cross to break line of sight with cover. There’s also an optional NPC battle in this area. Hug the right wall and you’ll come to some ruins leading into a nice arena. When you reach the far side, Shira appears. She’s pretty mad at you for waking Filianore, and who can blame her? She can be cheesed with Hidden Body but will use Estus, so it will probably come down to a duel sooner or later. Try a summon for best results; she’s not good at multiple targets and can be backstabbed. Killing Shira nets you the Crucifix of the Mad King weapon. Anyway, head to the other end of this ashy area to trigger the final boss.